What does charley horse mean? A charley horse is an involuntary muscle spasm or cramp, usually occurring in the larger muscles of the limbs. It can last anywhere from a few seconds to more than a day. And it hurts, like makes-you-have-to-stop-everything-you're-doing-and-want-to-curl-up-in-a-ball hurts. She said heat cramps will present similar to a charlie horse or muscle cramp. She said people with heat cramps need to get out of the sun and and drink water. You’ve been on the road for days. You’re exhausted. Finally you take a shower and climb into your bunk ready for a few wonderful hours of sleep. An hour passes in dreamland when suddenly your leg goes into spasm – the attack of the dreaded charley horse! 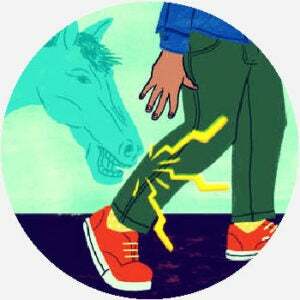 Where does charley horse come from? The ultimate origin of the term charley horse is murky, but it first appears in the context of baseball in the 1880s. Back then, baseball players called various muscle injuries, including cramps, bruising, and other pains and sores, charley horses. One story says the term comes from a lame horse, named Charley, that pulled equipment at the Chicago White Sox’s in the late 19th century. Poor Charley’s limping stride became so familiar to the baseball players that, whenever one of them sustained a muscular injury in the lower body that made it hard to walk, they called it a charley horse. Another tale goes that the term originated with Charley “Old Hoss” Radbourn, a National League pitcher notably afflicted with leg cramps and muscle pain in the late 1880s. Charley horse combined Radbourn’s first name and altered the second part of his nickname. While originating as an Americanism, charley horse spread to other Englishes over the 20th century. It also spread into popular culture. Milton Bradley included a charley horse injury in his 1965 game Operation, in which a person earn big points by removing a tiny plastic horse from the slot. Note: This is not how to treat an actual charley horse. Doctors say to stretch, massage, or ice the cramping muscle, not try and pull a little horse out of it. Charlie Horse, punningly, was the name of a character on the 1990s children’s puppet show, Lamb Chop’s Play-Along! Charley Horse is also a band based in Sydney, Australia that formed in 2010. 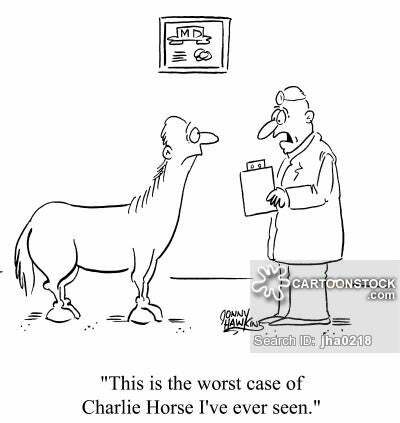 Charley horses often occur late at night while a person is sleeping. This is usually due to either an awkward position of the body or a vitamin deficiency that causes muscles to cramp after being relaxed for a period of time. Usually, a charley horse will resolve itself with time and treatment. However, if it persists, it may be smart to go to a doctor. Although it is best known as a runner or athlete’s injury, charley horses are also known to (very inopportunely) sneak up on lovers in bed.